Distinctive and exclusive are the two main words to illustrate this ring. The diagonal grooves put some accents to it while the diamond expresses the finesse of its design. This ring is the perfect blend of simple yet elegant details (silver inlay, diagonal grooves, one diamond), plus it is light and comfortable because it's titanium and has softly rounded edges. This ring is better than it looked online, when i got it I was amazed by the sleek design and stunning diamond in the center. 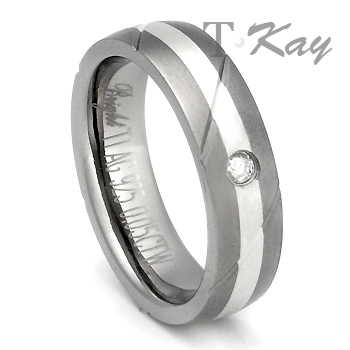 It's very masculine design is stunning and the diamond is just enough to give it that extra glimmer. My Fiance loved this ring! What a great choice!